He's the best there is. In fact, he's the only one there is! 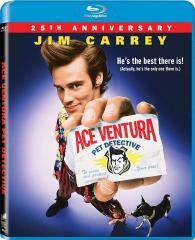 He's Ace Ventura Pet Detective. Jim Carrey (The Mask. Dumb and Dumber, Liar Liar) is on the case to find the Miami Dolphins' missing mascot and quarterback Dan Marino. He goes eyeball to eyeball with a man-eating shark, stakes out the Miami Dolphins and woos and wows the ladies. Whether he's undercover, under fire or underwater, he always gets his man...or beast!